This article is about a type of military unit. For other uses, see Platoon (disambiguation). According to Merriam-Webster, "The term was first used in the 17th century to refer to a small body of musketeers who fired together in a volley alternately with another platoon." The word came from the 17th-century French peloton, from pelote meaning a small ball. The suffix "-on" can be an augmentative suffix in French, but on the other hand is generally a diminutive suffix in relationship to animals, so the original intention in forming peloton from pelote is not clear. Nonetheless it is documented that it took the meaning of a group of soldiers firing a volley together, while a different platoon reloaded. This implies an augmentative intention in the etymology. Since soldiers were often organized in two or three lines, which were supposed to fire volleys together, this would have normally meant platoons organised with the intention of a half or a third of the company firing at once. The modern French word peloton, when not meaning platoon, can refer to the main body of riders in a bicycle race (as opposed to any riders ahead or behind the main body). Pelote itself originally comes from the low Latin "pilotta" from Latin "pila", meaning "ball", and the French suffix "-on" derives from the Latin suffix "-onus". The platoon was originally a firing unit rather than an organization. The system was said to have been invented by Gustavus Adolphus of Sweden in 1618. In the French Army in the 1670s, a battalion was divided into 18 platoons who were grouped into three "firings"; each platoon in the firing either actually firing or reloading. The system was also used in the British, Austrian, Russian and Dutch armies. On 1 October 1913, under a scheme by General Sir Ivor Maxse, the regular battalions of the British Army were reorganised from the previous eight companies to a four company structure, with each company having four platoons as separate units each commanded by a lieutenant with a platoon sergeant as his deputy. Each platoon was divided into four sections, each commanded by a corporal. Due to a shortage of officers, a non commissioned officer rank of Platoon Sergeant Major was introduced from 1938 to 1940 for experienced non-commissioned officers who were given command of platoons. In the Australian Army, an infantry platoon has thirty-six soldiers organized into three eight-man sections and a twelve-man maneuver support section. A lieutenant as platoon commander and a sergeant as platoon sergeant, accompanied by a platoon signaller and sometimes a platoon medic (full strength of forty men). A section comprises eight soldiers led by a corporal with a lance corporal as second in command. Each section has two fireteams of four men, one led by the corporal and the other by the lance corporal. Each fireteam (also called a "brick" by Australian soldiers) has one soldier with a 7.62mm Maximi GSMG and the other three armed with F88 Steyr assault rifles. One rifle per fireteam has an attached 40mm grenade launcher; one of the grenadiers is the lance corporal. Fireteam bravo has a HK417 7.62mm for the designated marksman role. More recently, the designated marksman of each Australian fireteam has been issued the HK417 in Afghanistan and possibly afterwards. The platoon may also have three MAG 58 general-purpose machine guns, one M2 Browning heavy machine gun or a Mk 19 grenade launcher at its disposal. In the British Army, a rifle platoon from an infantry company consists of three sections of eight men, plus a signaller (radio operator), a platoon sergeant (a sergeant), the platoon commander (either a second lieutenant or lieutenant) and a mortar man operating a light mortar (full strength of 27 men and one officer). This may not be the case for all British Infantry units, since the 51mm mortars are not part of the TOE post-Afghanistan. Under Army 2020, a platoon in the Heavy Protected Mobility Regiments will consist of around 30 soldiers in four Mastiff/FRES UV vehicles. As of March 2016, the British Army is reviewing whether to retain the FN Herstal Para Minimi 5.56×45mm light machine gun and the M6-640 Commando 60 mm mortar at platoon level in dismounted units. Each section is commanded by a corporal (lance sergeant in the Foot Guards), with a lance corporal as second-in-command and six riflemen divided into two four-man fireteams. Support weapons platoons (such as mortar or anti-tank platoons) are generally larger and are commanded by a captain with a colour Sergeant or WO2 as 2ic. Some sections are seven-man teams – particularly in the case of the Warrior within armored regiments, as it only seats seven soldiers. In the Bangladesh Army, infantry regiments have platoons commanded by a major or a captain, assisted by two to four lieutenants (or combination of lieutenants and Junior Commissioned Officers) and at least two sergeants. The platoon strength is typically 30 to 50 soldiers. In the Canadian Army, the infantry Platoon Commander is a second lieutenant, lieutenant or a junior captain assisted by a platoon warrant (who holds the rank of warrant officer, but can be a Sergeant). It is usually divided into three eight to ten person sections and a heavy weapons detachment which will deploy a GPMG, and a Carl Gustav, depending on mission requirements. Sections are commanded by a Sergeant or Master Corporal with a Master-Corporal or Corporal in the second in command, or 2IC, position; two members of a section will carry C9 LMG's and the remainder will carry C7 or C8 assault rifles fitted with either optics or a grenade launcher. A section is broken into two assault groups, similar to the British and Australian organization. Three infantry platoons will make up a typical infantry company, sometimes with a heavy weapons or support platoon in addition. Specialist platoons, like reconnaissance, or "recce" platoons, that may be attached to a battalion may be led by a captain and assisted by a warrant officer. Some very large specialist platoons will actually have a lieutenant as the second-in-command. In many corps, platoon-sized units are called troops instead. Prior to 1940, a platoon might be commanded by either a warrant officer WO III or a lieutenant. An officer was referred to as "platoon commander", while a WO III in the same position was called a "Platoon Sergeant Major" or PSM. Within the Colombian Army, a training platoon (in Spanish pelotón) is often commanded by a higher-ranking soldier known as a dragoneante, who is selected for his excellence in discipline and soldiering skills. However, a dragoneante is still a soldier and can be removed from his position if his commander sees fit. For combatant platoons (platoons engaged in combat with guerrilla rebels), a corporal or sergeant would be the most likely commander. Under the 1791 regulations a peloton in the French Army was used in the equivalent manner to a company, with the first section led by the sous-lieutenant and the second section led by the lieutenant, a captain commanding the entire group. In the French military : - A peloton is a mainly a term designating an infantry unit. - An escadron is a unit of battle tank in cavalry or armor but in some Mechanized Infantry regiment (groupe de chasseurs mécanisés), the tank platoon is also called peloton de char de combat ... The peloton or escadron correspond to the platoon, equivalent in size to an infantry section, and commanded by a lieutenant or sergeant. It may also mean a body of officers in training to become noncommissioned officers, sous-officiers or officers (peloton de caporal, peloton des sous-officiers). Finally, "peloton d'exécution" is the French term for a firing squad. The Georgian Armed Forces equivalent of the platoon is the so-called Ozeuli. Translated, it means "Group of 20", but has no more connection whatsoever with the number. It has been transferred into modern usage from medieval army reforms of the Georgian king David the Builder. Originally, it was meant to be a small detachment of exactly 20 men to be led by a leader of corresponding rank. Almost all smaller formations are based on the designations of those reforms, which originally suggested tactical flexibility by keeping the size of small units in round numbers (10, 20, 100). Battalions and brigades were not affected by that system. It is unknown whether that usage was abandoned in the 1820s or earlier, but in present days a Georgian platoon still called "Ozeuili" has a similar size to that of other armies. Normally for infantry it has 32 men, but can vary depending on the type of unit. The German Army equivalent of the platoon is the Zug (same word as for train, draught, move or streak), consisting of a Zugtrupp ("platoon troop" or platoon headquarters squad), of four to six men, and three squads (Gruppen) of eight to eleven men each. An Oberfeldwebel ("Sergeant first class") is in charge of the Zugtrupp. The Zugtrupp provides support for the platoon leader and acts as a reserve force (such as two additional snipers or an anti-tank weapon crew). Three Züge make up a Kompanie ("company"). 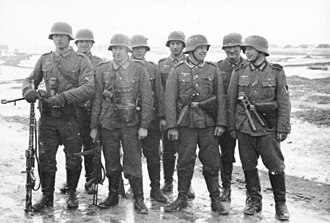 The first platoon, until 2013, used to be commanded by an Oberleutnant ("first lieutenant") or a Leutnant ("second lieutenant"), nowadays it is usually a Hauptmann ("captain"), who is also the Kompanie's second-in-command. The second Zug is nowadays led by an Oberleutnant or a Leutnant, the third Zug is led by experienced NCOs, usually a Hauptfeldwebel ("master sergeant"). In the first platoon, the platoon leader's assistant is a Hauptfeldwebel; in the second and third platoons, the assistant is an Oberfeldwebel. Each squad is led by an Oberfeldwebel, and its size corresponds to the typical passenger capacity of its squad vehicle (either wheeled or armoured). Another of these vehicles is used for the Zugtrupp. Sergeants of inferior rank act as assistant squad leaders in the other squads. A Fallschirmjägerzug ("airborne infantry platoon") has special operations responsibilities, and has command positions one rank higher than corresponding positions in a standard infantry platoon. A captain (Hauptmann) is the platoon leader, assisted by a first lieutenant and each squad has a second lieutenant or a master sergeant in charge, often supported by a long-service sergeant or skilled senior corporal. In the Hungarian Armed Forces, a Rifle Platoon is commanded by either a 2nd Lieutenant or a 1st Lieutenant, with a Platoon Sergeant (with the rank of Sergeant Major), a Platoon Signaller, an APC driver and an APC gunner comprising the Platoon Headquarters. There is also in the HQ's TO&E a designated marksman rifle—either an SVD or a Szép sniper rifle. The Platoon is sub-divided into three squads, each with eight soldiers. Each squad is commanded by a Sergeant. His/her deputy has an RPG, there are also two soldiers with PKM machine guns, two with AK-63 assault rifles—one is an RPG grenadier, the other is the Medic—the APC driver and the APC gunner. Each squad and the platoon headquarters is equipped with an BTR-80 Armoured personnel carrier. In total, the platoon comprises 29 soldiers, of whom eight are vehicle crew. The Israel Defense Forces uses platoons (Hebrew: "mahlakot", literally "divisions") as the basic unit composing the company and usually consists of 30 to 65 soldiers (or 3–4 tanks in the Armored Corps). Those soldiers are divided into 2–4 "classes" ("Kitot") or teams ("Tzvatim"), each composing of 6–21 soldiers. The platoon is the smallest military unit commanded by a commissioned officer—and all officers graduating from the IDF's Officer's Academy receive a "platoon commander" pin, even if they are not intended to command a platoon. The platoon commander is usually the equivalent of First or Second lieutenant, and is assisted and advised by a platoon sergeant, acting as his replacement. In some elite units, such as Sayeret Matkal, Shayetet 13 or Duvdevan, the teams are usually smaller and themselves commanded by officers, with the platoon commanded by a higher-ranking officer. In the New Zealand Army, an Infantry Platoon is commanded by a 2nd Lieutenant or a lieutenant, with a Platoon Sergeant, a Platoon Signaller and a medic (where relevant) comprising the Platoon Headquarters. The Platoon is sub-divided into three section of between 7-10 soldiers, each commanded by a Corporal with a Lance-Corporal as the Section 2iC. Each section can be sub-divided into two fire-teams, commanded by the Section Commander and 2iC respectively, as well as normal two man Scout, Rifle and Gun Teams. There are three Platoons in a Rifle Company, which is commanded by a Major, and three Rifle Companies in an Infantry Battalion, which is commanded by a Lieutenant-Colonel. An Infantry Battalion will also contain an organic Support Company (Mortars, Machine-Guns etc.) and a Logistics Company (Transport and Stores). A motorised rifle platoon in the Soviet Armed Forces was mounted in either BTR armoured personnel carriers or BMP infantry fighting vehicles, with the former being more numerous into the late 1980s. Both were led by a platoon leader and assistant platoon leader and consisted of three 9-man rifle squads mounted in three vehicles. In both BMP and BTR squads, the driver and vehicle gunner stayed with the vehicle when the rest of the squad dismounted, and one squad in the platoon would have one of their rifleman armed with an SVD sniper rifle. There was either one empty seat in each BTR or two empty seats in each BMP to accommodate the platoon leader and assistant platoon leader. 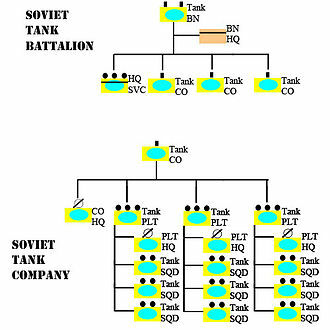 Tank platoons prior to the late 1980s consisted of a platoon headquarters squad and three tank squads, each consisting of one T-64, T-72 or T-80 tank for 12 personnel and 4 tanks total; platoons that used the older T-54, T-55 or T-62s added another crewmember for a total of 16. However, tank units operating in Eastern Europe began to standardize their platoons to just two tank squads, for a total of 3 tanks and 9 personnel. In the Singapore Army, a platoon is a Lieutenant's billet. However, in practice, a Second Lieutenant is usually appointed and then eventually promoted. A typical infantry platoon consists of three seven-man sections of riflemen and a machine gun team, both commanded by Third Sergeants, a platoon sergeant and a platoon medic for a total of 27 soldiers. Beginning in 1992, the Singapore Armed Forces has allowed warrant officers to be appointed as platoon commanders. Ställföreträdande plutonschef -- Deputy platoon leader. Tolk -- Interpreter (only present for deployments abroad). 2 soldater tillika pansarskotts-/granatgevärsskyttar/fordonsförare -- 2 riflemen armed with AT4/Carl Gustav gunner and loader/vehicle driver. 1 soldat tillika skarpskytt -- 1 marksman. In the Royal Thai Army, a platoon is commanded by either a Lieutenant or Second Lieutenant, assisted by a Platoon Sergeant, usually of the rank of sergeant major. In infantry units, rifle platoons are generally made up of five squads (three rifle squads, one machine gun squad and the command squad). From the 1700s up until the late 1800s in what would become the United States, an infantry platoon was a "half company" commanded by a lieutenant, assisted by two sergeants and two corporals (increased in 1861 to four corporals). The sergeants, assisted by the corporals, led the two sections (half-platoons) and the squads (the terms were often used interchangeably until 1891) of the platoon. An additional senior sergeant serving as the "platoon sergeant" (originally designated as "assistant to platoon commander" from 1917 until 1940, and as "platoon leader" until 1943, when officer platoon commanders were re-designated as "platoon leaders") was not authorized until 1943. Depending on the time period, the platoon could include from as few as 20 privates (with two corporals, two sergeants, and a lieutenant) to as many as 44 (with four corporals, two sergeants, and a lieutenant) with 10 to 22 privates per section. The corporals, and the sergeant, prior to the increase to two corporals per section, led the two squads of the section. The squads were primarily a non-tactical sub-unit used mainly for drill (marching practice, formations, ceremonies, etc.) and "house-keeping" matters, such as interior guard duty, billeting, messing, fatigue details (i.e., working parties), etc. Indeed, the sections, as well as the platoons, were primarily administrative sub-units of the company, since tactically the company seldom employed in other than as a massed formation. The standard procedure, once the company had marched into its position in the line of battle, was for the company to form facing the enemy as two ranks, by platoon, one behind the other. The commanding officer (a captain), and the one to three lieutenants, serving as platoon commanders (not designated as platoon "leaders" until 1943) and the executive officer (again depending on the time period, but not officially authorized until 1898) would direct the fighting, leading from the front in the attack and on the flanks in the defense. The executive officer, when assigned, or usually the junior lieutenant and the first sergeant were normally positioned behind the battle line so as to assist the company commander in overseeing the company and managing the rear (company trains, including the wagoner and company supply wagon - under the supervision of the quartermaster sergeant, as well as casualties, enemy prisoners, non-combatants, deserters, etc.). While the officers managed the battle and the staff NCOs (first sergeant and quartermaster sergeant) superintended logistics, the NCOs (sergeants and corporals) served as first-line supervisors and leaders by exhibiting a soldierly example for their privates and encouraging them to maintain proper discipline and to fight effectively. In so doing, the sergeants acted as "file closers", working the line by putting men forward to replace casualties in the front rank, exhorting men to fire, reload, move forward, etc. and, if need be, physically assisting or restraining men who refused to move forward or attempted to flee. The corporals physically led by example (much like modern fire team leaders) by taking their place in the line with their privates, fighting alongside them, and by demonstrating proper soldierly attributes. Cavalry platoons had a similar organization to the infantry, but with fewer men; platoons rarely exceeded around 33 men, including the lieutenant, sergeants and corporals. Field artillery platoons, led by a lieutenant (who rode his own horse), with two or three to a battery, normally consisted of two gun sections. Each gun section was led by a sergeant (who also rode his own horse) and consisted of two half sections led by a corporal. One half section contained the gun and its implements, its limber (including one ammunition chest) and four to six horses (depending on gun weight and available horses), and several members of the gun crew. The corporal and one or two privates rode on the horses pulling the limber, while a couple of privates rode on the ammunition chest lid seat. The other half section consisted of the caisson (which carried two ammunition chests, tools, spare parts, baggage, and a spare wheel) with its limber (again with one ammunition chest), pulled by four to six horses, and two spare horses (when available) tethered to the rear of the caisson, and the remainder of the gun crew with the corporal and privates riding the horses or sitting on the several ammunition chests lid seats as described above. In total, the field artillery platoon (at full strength of men, horses, and equipment) consisted of a lieutenant, two sergeants, four corporals, 24 privates, 31 horses, four limbers, two caissons, two field guns, two spare wheels, plus ammunition, implements, tools, spare parts, and baggage. By the end of World War I in 1918, the rifle platoon had expanded to its largest size in U.S. Army history into a unit of 59 soldiers. This platoon organization included one lieutenant, three sergeants, eight corporals, 15 privates first class, and 32 privates. The platoon was organized into a six-man platoon headquarters (including the platoon commander, a sergeant as "assistant to platoon commander", and four privates as "runners" or messengers) and four sections. The sections were specialized by primary weapon and each contained a different number of men. The "Riflemen" and "Automatic Riflemen" sections were each led by a sergeant and divided into two squads of eight and seven men each, respectively, including a corporal to lead each squad. The "Hand Bombers" (i.e., hand grenade throwers) and "Rifle Grenadiers" sections had a total of twelve and nine men each, respectively, including two corporals each, but no sergeant. 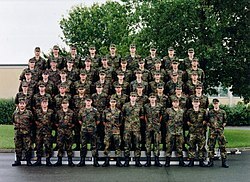 In the United States Army, rifle platoons are normally composed of 42 soldiers. They consist of three rifle squads, one weapons squad, and a six-man headquarters. The headquarters consists of a Platoon Leader (PL)--usually a second lieutenant (2LT), a Platoon Sergeant (PSG)--usually a Sergeant First Class (SFC, E-7), a radio-telephone operator (RTO), a platoon forward observer (FO), the FO's RTO, and the platoon medic. 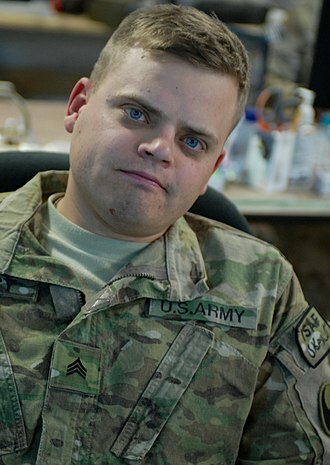 Each squad is led by a Sergeant, who is usually a Staff Sergeant (SSG, E-6). The rifle squads each consist of two fire teams and a squad leader, while the weapons squad consists of two medium machine gun teams, two close combat missile teams, and a squad leader. In the United States Marine Corps, rifle platoons nominally (per TO) consist of 43 Marines and are led by a platoon commander, usually a second lieutenant (O-1), assisted by a platoon sergeant, a staff sergeant (E-6). The platoon headquarters also includes a platoon guide, a sergeant (E-5), who serves as the assistant platoon sergeant and a messenger (Pvt or PFC). Rifle platoons consist of three rifle squads of 13 men each, led by a sergeant (E-5). In the attack (especially if part of the assault echelon) or in a deliberate defense, rifle platoons are usually augmented with a two-man mortar forward observer team and are often reinforced with a seven-man machinegun squad and/or a four-man assault weapons squad. A weapons platoon will usually have a first lieutenant (O-2) and a gunnery sergeant (E-7) due to the generally larger number of Marines (up to 69 in the 81mm mortar platoon) in these platoons (the heavy machinegun platoon being the exception with only 28 members) and the more complex weapon systems employed. A rifle company weapons platoon has a 60mm mortar section of 13 Marines with three M224 LWCMS 60mm mortar squads, an assault section of 13 Marines and six SMAW rocket launchers divided into three squads of two teams each, and a medium machine gun section of 22 Marines and six M240G general-purpose machine guns divided into three squads of two teams each. The infantry battalion weapons company consists of three heavy weapons platoons: 81mm mortar, heavy machinegun (.50cal HMG and 40mm AGL), and anti armor (Javelin missile and Antitank TOW missile). Each of these three platoons is divided into sections. Three sections of two squads each in the heavy machinegun platoon, two sections of four squads each in the 81mm mortar platoon, one section of two squads with four teams each in the Javelin missile section, and one section of four squads with two teams each in the antitank TOW missile section. Marine rifle or weapons platoons would also have from one to four navy hospital corpsmen assigned along with the Marines. Platoons are also used in reconnaissance, light armored reconnaissance (scout dismounts), combat engineer, law enforcement (i.e., military police), Marine Security Force Regiment (MSFR), and Fleet Antiterrorism Security Team (FAST) companies. In low altitude air defense (LAAD) batteries, the firing platoons consist of three sections, each consisting of a section leader and five two-man Stinger missile teams. In artillery batteries, the firing platoon consists of six artillery sections, each containing one gun with its crew and prime mover (i.e., a truck to tow the artillery piece and transport the gun crew and baggage). The United States Air Force has a similarly sized and configured unit called a flight. A flight usually ranges from a dozen people to over a hundred, or typically four aircraft. The typical flight commander is a captain. The typical flight chief is a master sergeant. Letter designations can be used, such as Alpha Flight, Bravo Flight, etc. 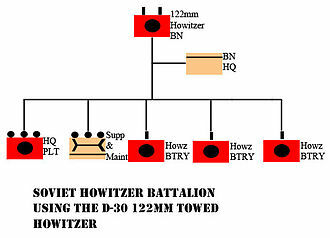 ^ "Infantry Platoon and Squad ATP 3-21.8" (PDF). Retrieved 28 November 2017. ^ "Organization of Marine Corps Forces MCRP5-12D" (PDF). Retrieved 28 November 2017. ^ a b "Definition of PLATOON". www.merriam-webster.com. ^ "Table of Ranks and Responsibilities". Canadian Soldiers. Retrieved August 9, 2012. ^ United States Army. Center of Military History. Organization of the American Expeditionary Forces, Volume 1, Washington, DC, 1988, p.347. ^ "US Army Table of Organization". orbat.com. Archived from the original on 2007-08-26. Retrieved 2007-02-16. Look up platoon in Wiktionary, the free dictionary. "Platoon" . Encyclopædia Britannica (11th ed.). 1911. A troop is a military sub-subunit, originally a small formation of cavalry, subordinate to a squadron. In many armies a troop is the equivalent element to the section or platoon. Exceptions are the Royal Horse Artillery and the US Cavalry, where troops are subunits that compare to a company or artillery battery. A cavalry soldier of private rank is called a trooper in many Commonwealth armies, a related sense of the term troops refers to members of the military collectively, as in the troops, see Troop. In some countries, like Italy, the cavalry unit is called Squadron. Today, a troop is defined differently in different armed forces, SASR troops are unusual as they are commanded by a captain—most troop/platoon sized elements are commanded by a lieutenant. In all cases, units which refer to platoon sized elements as troops refer to company-sized elements as squadrons, privates in the RAAC and SASR hold the rank trooper, however this is not the case for any other Corps/units which use the term troops. In the British Army the definition of a troop varies by corps, household Cavalry and Royal Armoured Corps, Three or four armoured fighting vehicles commanded by a subaltern, i. e. effectively the same level element as an infantry platoon. A unit of two to four guns or launchers, or an equivalent headquarters unit, in the Royal Horse Artillery, a troop used to be the equivalent to a battery in other artillery units. The Royal Engineers and Royal Corps of Signals used platoons instead until after World War II, other army corps do not use the term. In the Royal Marines, a troop is the equivalent to an army platoon, in the Canadian Army, a troop is the equivalent of a platoon within the armoured, artillery and signals branches. Two to four troops comprise the elements of a squadron. Companies were renamed troops in 1883, in the United States, state police forces are often regionally divided into troops. This usage came about from these organizations modelling themselves on the US Army, for this same reason the state police and highway patrol personnel of most states are known as trooper rather than officer. Lance corporal is a military rank, used by many armed forces worldwide, and by some police forces and other uniformed organizations. It is below the rank of corporal, and is typically the lowest non-commissioned officer and it can be translated as one who has broken a lance in combat, and is therefore a leader. Lance or lances fournies was a used in Medieval Europe to denote a unit of soldiers. In Commonwealth forces, a corporal is usually the second in command of a section. Lance corporals are commonly addressed as corporal, with lance jack or half-screw being common colloquialisms for the rank, much like the use of bombardier instead of corporal in artillery units, lance corporals are known as lance-bombardiers in the UK, Australia and New Zealand. The badge of rank is a 1-bar chevron worn on both sleeves or on an epaulette, Lance corporal is the lowest of the non-commissioned officer ranks in the Australian Army and New Zealand Army, falling between private and corporal. It is the appointed rank, and thus demotion is easier than with other ranks. A lance corporal is usually the second in command of a section, there is no equivalent rank within the Royal Australian Air Force or Royal Australian Navy. Second corporal was formerly used in Australia in the same way that it was used in the British Army. The Canadian Forces abolished the Canadian Army rank of corporal on their creation as a unified force in 1968. The rank of trained private equates to OR-3 and wears the single chevron, Lance corporal is the lowest ranking non-commissioned officer in the British Army and Royal Marines, between private and corporal. The badge of rank is a one-bar chevron worn on both sleeves, or on an epaulette on the front of the Combat Soldier 95 dress standard, the Royal Artillery uses the term lance-bombardier instead. The designation chosen man, used during the Napoleonic Wars, was a precursor to the rank, the date of introduction of lance corporals to the British Army is unclear. The first reference to a corporal in the London Gazette is in 1831. However, the first mention of the rank in The Times is in 1819, the first mention in the London Gazette of a lance corporal in the Royal Marines is in 1838. The commanding officer or, if the incumbent is a general officer, commanding general, is the officer in command of a military unit. Typically, the officer has ultimate authority over the unit. In this respect, commanding officers have significant responsibilities, duties, in some countries, commanding officers may be of any commissioned rank. The commanding officer is assisted by an executive officer or second-in-command, who handles personnel and day-to-day matters. Larger units may have staff officers responsible for various responsibilities, in the British Army, Royal Marines, and many other Commonwealth military and paramilitary organisations, the commanding officer of a unit is appointed. 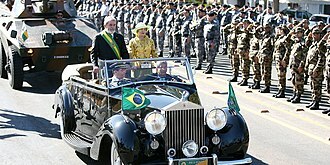 Thus the office of CO is an appointment, the appointment commanding officer is exclusive to commanders of major units. It is customary for an officer to hold the rank of lieutenant colonel, and he or she is usually referred to within the unit simply as the Colonel or, more commonly. The Colonel is usually an appointment of a senior officer who oversees the non-operational affairs of a regiment. However, the rank of the appointment holder and the appointment are separate. That is, not all lieutenant colonels are COs, and although most COs are lieutenant colonels, sub-units, that is, company and battery, and formations do not have a commanding officer. The officer in command of a sub unit holds the appointment officer commanding or OC, higher formations have commanders or a General Officer Commanding. In some cases, independent units smaller than a sub-unit, e. g. a platoon of Military Police that reports directly to a such as a brigade. In these cases, the officer commanding can be a captain or even a lieutenant, appointments such as CO and OC may have specific powers associated with them. For example, they may have powers to promote soldiers or to deal with certain disciplinary offences. The CO of a unit may have the power to sentence an offender to 28 days detention, units smaller than sub-units, i. e. platoons and sections are not specific appointments and officers or NCOs who fill those positions are simply referred to as the commanders/leader. E. g.
In military aviation, a wing is a unit of command. In most military services, a wing is a relatively large formation of planes. 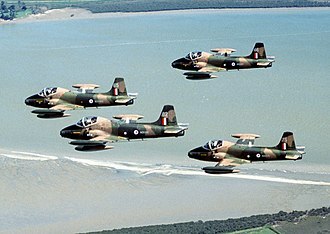 In Commonwealth countries a wing usually comprises three squadrons, with several wings forming a group, each squadron will contain around 20 planes. On its establishment in 1912, the British Royal Flying Corps was intended to be an inter-service, combined force of the British Army and Royal Navy. Given the rivalry existed between the army and navy, new terminology was used, in order to avoid marking the corps out as having an army or navy ethos. While the term wing had been used in the cavalry, its general use predominated. 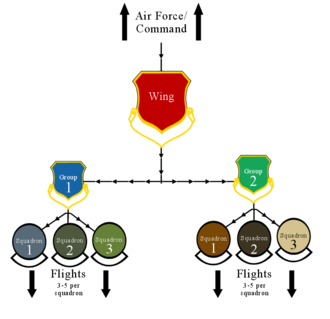 Accordingly, the wing, with its allusion of flight, was chosen as the term of subdivision and the corps was split into a Military Wing. Each wing consisted of a number of squadrons, by 1914, the naval wing had become the Royal Naval Air Service, and gained its independence from the Royal Flying Corps. The Royal Flying Corps was amalgamated with the Royal Naval Air Service in 1918, the RFC usage of wing was maintained in the new service. A patrol is commonly a group of personnel, such as law enforcement officers or military personnel, that are assigned to monitor a specific geographic area. This is referred to as a beat. The basic task of a patrol is to follow a route with the purpose of investigating some feature of interest or, in the assignment of a fighting patrol, to find. A patrol can mean a small cavalry or armoured unit, subordinate to a troop or platoon, usually comprising a section or squad of mounted troopers, or two AFVs. A patrol officer is often the first to arrive on the scene of any incident, the patrol officer, as the person who is in the field daily, is often closest to potential crime and may have developed contacts who can provide information. The Philadelphia Foot Patrol Experiment, a randomized control trial conducted by Temple University, has shown that foot patrols reduce crime, with the resources to patrol 60 locations, researchers identified the highest violent crime corners in the city, using data from 2006 to 2008. Corporal is a military rank in use in some form by many militaries and by some police forces or other uniformed organizations. Within NATO, each member nations corresponding military rank of corporal is combined under the NATO-standard rank scale code OR-4, there are often differences in how each nation employs Corporals. Some militaries dont have Corporals, but may instead have a Junior Sergeant, in some militaries, the rank of corporal nominally corresponds to commanding a section or squad of soldiers. The lateral promotion is used to make the soldier a non-commissioned officer without changing the soldiers pay, as the Table of Organization & Equipment rank of a fire team leader is sergeant and that of squad leader is staff sergeant. 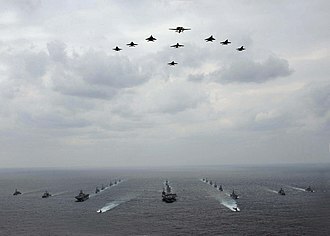 In most countries that derive their military structure from the British military system, the word is derived from the medieval Italian phrase capo corporale. It may be derived from an appointment as an officers bodyguard, all three branches of the Armed Forces of the Argentine Republic use two or three ranks of corporal, or cabo. Corporals in the Argentine military are considered suboficiales subalternos, superior only to all ranks of Volunteers, in the Argentine Army, there are two ranks of corporal and senior, Cabo and cabo primero. While the Argentine Navy has three ranks, from junior to senior, Cabo segundo, Cabo primero and cabo principal. The Air Force has the number of corporal ranks as the navy. The rank is used by the Argentine National Gendarmerie and the Argentine Federal Police. Corporal is the second lowest of the officer ranks in the Australian Army. 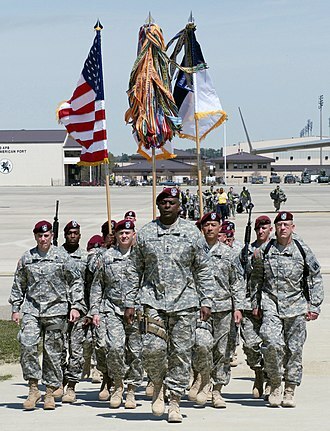 A corporal is usually appointed as a commander, and is in charge of 7-14 soldiers of private rank. They are assisted by a second-in-command, usually a lance-corporal or senior private, a Corporal within Artillery is known as a bombardier. Corporal is a rank of the Royal Australian Air Force, with the exception Belgian Naval Component, the branches of the Belgian Armed Forces use three ranks of corporal, master corporal and 1st master corporal. Corporal is equivalent to NATO Rank Code OR-3, whereas master corporal, the rank immediately below corporal is 1st private and the rank directly above 1st master corporal is sergeant. US Marines on patrol in Afghanistan, 2009. An example of fire and maneuver in actual combat. 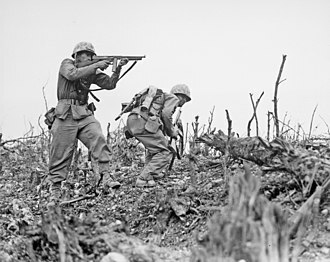 Here, during the Battle of Okinawa, a US Marine on the left provides covering fire for the Marine on the right to break cover and move to a different position. UN Peacekeepers in Eritrea monitoring the Eritrea-Ethiopia international border. 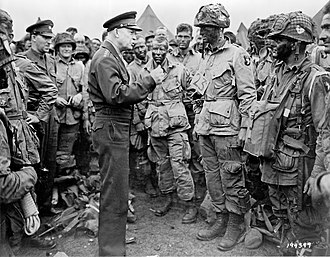 General Dwight D. Eisenhower speaks with American paratroopers of the 502nd Parachute Infantry Regiment, part of the 101st Airborne Division, shortly before the D-Day landings of 6 June 1944 during World War II. Unified Combatant Command of the United States.